I had some help with our first experiments on RGB imaging with an MTV-22S85HC-EX monochrome 1/2" chip Mintron. 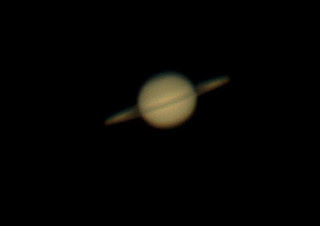 Wayne Jones, new member of the Swansea Astronomical Society, used his 130mm F:900mm Newtonian on a driven equatorial mount. He used Red Green and Blue simple colour filters that are not designated for RGB imaging but which have good characteristics of filtering out the other colours. The technique he used was to place the Mintron back in the focuser in exactly the same orientation after each filter change. 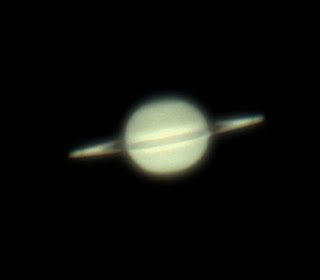 This was essential because there was not enough in focus on the scope to use a filter wheel. He has devised an ingenious way of doing this. AVIs were captured at different levels of frame accumulation for each filter. The unique frames were extracted from the AVIs using VOB Frame extractor which will work on AVI containers as well as DVD VOB files. 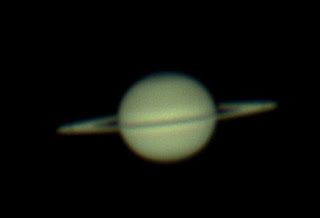 The frames were stacked in Registax and the different 'exposures' registered and combined in Flexible Image Combine, which computes a weighted average of the frames used. The resulting monochrome images taken through Red Green and Blue filters were registered and combined into an RGB image in CAP (Colour Alignment Processor). The final image was adjusted for levels, colour balance and saturation in The Gimp image processor. 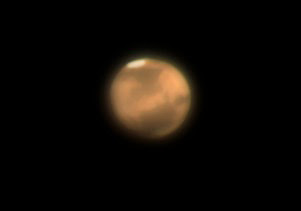 I used a Skymax 127 on an equatorial mount with a Kson manual filter wheel. The Red and Green filters were Opticstar Imaging filters and the blue filter was a Kson filter, somewhat darker than the Opticstar one. With hindsite, maybe this was a mistake. 15 minutes of DVD were recorded with each filter and 10 minutes without a filter. However, for all of the video, a Skywatcher light pollution filter was on the nosepiece of the MTV-22S85HC-EX 1/2" chip monochrome Mintron. 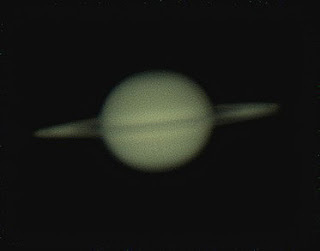 The unique frames were extracted from the DVD VOB files and were stacked in Registax. The resulting monochrome images were registered and combined as RGB colour layers in the CAP software. The final image was adjusted for levels, colour balance and saturation in The Gimp image processing software. The RGB image produced above was registered and combined with the Luminance image in FIC (Flexible Image combine) weighted averaging software to produce the LRGB image below. The RGB image was given a weight of 6 with the Luminance image having a weight of 1. At last I have finished stacking the approx. 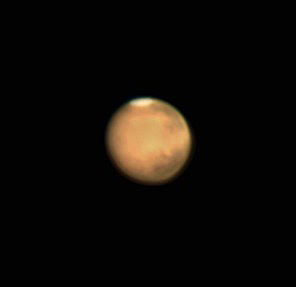 30,000 frames of Mars and Saturn I took last night. 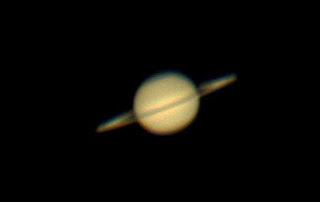 The above shots are all taken through my Celestron 11" telescope and a DBK21 camera. The Mars shots were by a 2x barlow and a 3x. 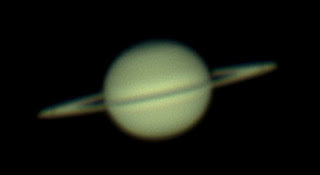 With Saturn the first image is a 2x barlow, followed by a Meade 3x barlow, then a Tal 3x barlow and lastly a 5x barlow (resized). This last image was pushed a little too far as it is not as good as the other shots. Keith has been busy again! 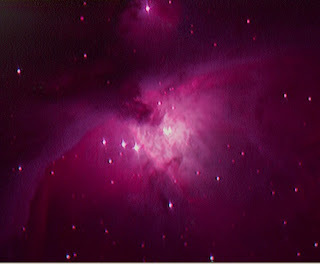 All the images above were taken through his Celestron 11" and DBK21 camera. 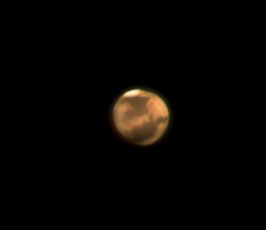 The first Mars image was taken with a 2x barlow and the second a 3x barlow, same again with the Saturn shots.